Our specialty is taking a stand-alone fire pump and making it a complete "system". We have decided that in order to provide the best field support, we work with your local fire pump distributor. This allows you get local support and our manufacturing expertise. Don't have a preferred local rep? Since we work with all the manufacturers, we can get you connected with a qualified representative. While we love working with your local pump rep, we can offer field start-up and annual pump testing upon request if you are somewhere more remote. Give us a call to discuss your needs. Since we work with all manufacturers, we have access to a broad range of replacement parts as needed. Per NFPA 20 paragraph 3.2.2* Authority Having Jurisdiction (AHJ) is "an organization, office, or individual responsible for enforcing the requirements of a code or standard, or for approving equipment, materials, an installation, or a procedure." Per IBC the AHJ is typically a "Building Official" who is appoint by the Department of Building Safety or Building Codes. 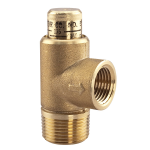 A circulation relief valve, not to be confused with a circulation relief valve, is required on all systems, except diesel engines taking cooling water from the pump discharge. The circulation relief valve is required to discharge adequate flow to prevent the pump from overheating when operating with no discharge. 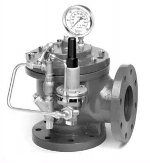 For pumps not exceeding 2,500 GPM in size a 3/4-inch valve is required, and for all other pumps a 1-inch valve is required per NFPA 20 (2010 edition) section 4.11.1.6. In more practical terms this means that the pumps conform to a certain set of pressure/flow requirements and the casings are designed to withstand three times the maximum operating pressure. Per NFPA 20 paragraph 3.3.17 "Fire Pump Controller. A group of devices that serve to govern, in some predetermined manner, the starting and stopping of the fire pump driver and to monitor and signal the status and condition of the fire pump unit." For electric motors, we find this to be one of the single biggest source of confusion with owners and engineers. Always double check with your local power company to ensure that what you are complying with their requirements. Many power companies require a reduced voltage controller if more than 30 HP. Per NFPA 20 paragraph 3.2.3* Listed is "Equipment, materials, or services included in a list published by an organization that is acceptable to the authority having jurisdiction and concerned with evaluation of products or services, that maintains periodic inspection of production of listed equipment or materials or periodic evaluation of services, and whose listing states that either the equipment, material, or service meets appropriate designated standards or has been tested and found suitable for a specified purpose." 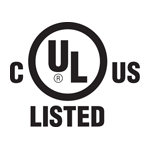 For the United States of America, this typically means UL listed or FM Approved. 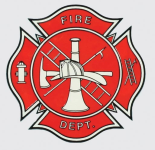 A main pressure relief valve, not to be confused with a circulation relief valve, is required on diesel engine driven fire pumps to protection the system in the event of a "runaway engine". However, not all diesel engine driven pump assemblies need a main pressure relief valve. The diesel engines are equipped with an overspeed feature that will shutdown the engine if it exceeds 110% of its rated RPM. Since the pressure delivered by a centrifugal fire pump is the square of the impeller speed, 110% of rated RPM translates to 121% of rated pressure. NFPA 20 (2010 edition) section 4.18.1.1 states " Where a diesel engine fire pump is installed and where a total of 121 percent of the net rated shutoff (churn) pressure plus the maximum static suction pressure, adjusted for elevation, exceeds the pressure for which the system components are rated, a pressure relief valve shall be installed." To simply all this wording down, For standard 175 PSI rated system, the simple answer is check and make sure that your expected churn pressure plus maximum static suction pressure will not exceed 144.6 PSI (or 206.6 PSI for a 250 PSI rated system). 3.3.21 Flooded Suction. 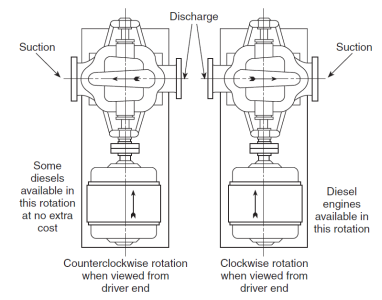 The condition where water flows from an atmospheric vented source to the pump without the average pressure at the pump inlet flange dropping below atmospheric pressure with the pump operating at 150 percent of its rated capacity.